Baby's delicate skin gets mild cleansing with this all natural baby bath soap. 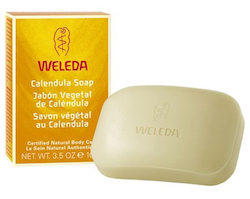 Weleda Calendula Soap is a lightly fragrant, moisture-balancing bar that's perfect for your baby's sensitive skin. Ingredients: Sodium Palmate, Sodium Cocoate, Water (Aqua), Sodium Olivate, Glycerin, Fragrance (Parfum), Limonene, Linalool, Citronellol, Geraniol, Calendula Officinalis, Chamomile Recrutita (Matricaria), Iris Germanica, Viola Tricolor, Oryza Sativa (Rice), Malt, Sodium Chloride. Fragrance from natural essential oils.